Sooner or later, your car will need to have its carburetor rebuilt. 10-15 years ago when carbureted cars where common, finding someone to rebuild one was no big deal but now, it is much more difficult to find someone who can do the work. The good news is that if your car has a Holley model 1931 one barrel (many 6 cylinder AMC's from the mid to late 60'a have one) you have one of the easiest carburetors to rebuild. 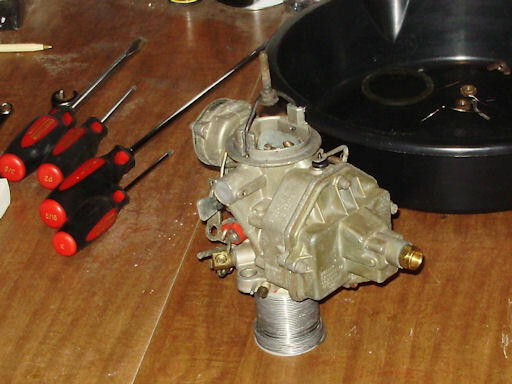 Other common one barrel carburetors AMC used in the 60'a are the Holley 1920 (very similar to the 1931 but the fuel bowl is a rectangle instead of a pentagon like the 1932) and Carter RBS (completely different animal). It was time for Kermit's to be rebuilt again so follow along as I tear it down, check everything, and put it all back together again. Note: It is recommending that you adjust the ignition system prior to removing the carburetor. This will make it much easier to get the car running when the rebuild is complete. Make sure the engine is cold. Chances are very good that you will spill some fuel and the last thing you want is a bunch of fuel dumped onto the exhaust. Remove the air cleaner and set it aside. You do not need to remove the PCV breather hose. You can gently turn the hose in the valve cover enough to get it out of the way. Note: do not try and remove the hose from the air cleaner unless you remove the PVC breather filter from it first. If you try to remove the hose with filter in place, you will destroy the hose. These hoses are hard to find in good condition. Disconnect the fuel inlet line at the carburetor. The flare nut on the line takes a 1/2" flare nut wrench and the fitting on the carburetor (that's the needle valve assembly) takes a 5/8" wrench. Always use a wrench on both fittings or you will bend the fuel line. Disconnect the choke tube at the carburetor with a 1/2" flare nut wrench. Once the nut is off of the choke hosing, you can gently wiggle the tube out of the manifold. Warning! The factory insulted these choke tubes with asbestos. If the insulation on it is starting to fray or is otherwise damaged, you should replace the factory tube with an aftermarket one. Those are available in the Help! section of your favorite auto parts store. Using either a 3/8" flare nut or combination wrench, remove the vacuum advance line from the carburetor. Remove the PCV hose from the adapter under the carburetor. The factory clamp was a spring clamp you can remove with a pair of pliers but it may have been replaced with a regular hose clamp at some point. Warning! Do not fight the hose if it is stuck. The adapter is made from phenolic plastic and they can be very brittle from age. This is another one of those parts that is hard to find. Using the needle nose pliers, remove the hairpin clip (this may have been replaced with a cotter pin) from the throttle rod. Remove the spring and washer from the carburetor. Pull the throttle rod out of the carburetor. Remove the throttle return spring. Remove the two 9/16" nuts holding the carburetor to the engine and remove the carburetor from the engine. Remove the PCV adapter. If it is tight to the engine, you can leave it in place since it may be brittle. Invert the carburetor and drain the fuel bowl through the vents on top. Cover the opening in the intake manifold with shop rags to keep junk out of the engine. Using a razor blade or gasket scraper, remove all of the old gasket from the intake manifold. Congratulations! You have now removed the carburetor and you are ready to take it apart and inspect it.